The satellite industry is at the cusp of a major transformation and, despite attracting less hype than other elements of the industry, the Ground Segment must play a primary role in opening new markets. The opportunity is also extraordinary, according to NSR’S Commercial Satellite Ground Segment 2nd Edition report, with annual equipment revenues surpassing $15.3 billion by 2026. However, given the Ground Segment presents many different technology and market trends for each type of equipment, where will the opportunities flourish? 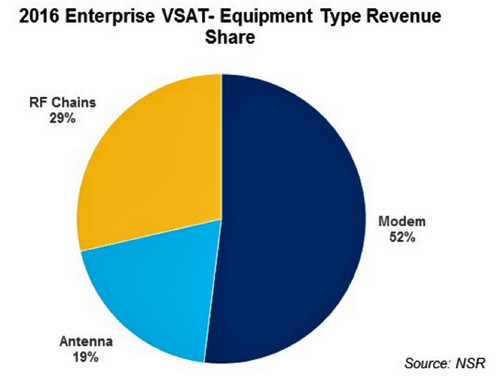 Despite broadband attracting most of the headlines, the reality is that Satellite TV (satTV) still generates the clear majority of equipment revenues on the form of Set-Top-Boxes (STBs) and Antennas. Having said that, most of the growth will come from VSAT platforms in markets such as Aero, Backhaul and Consumer Broadband. With ~150x times more shipments than any other vertical, satTV is the clear driver for volume. 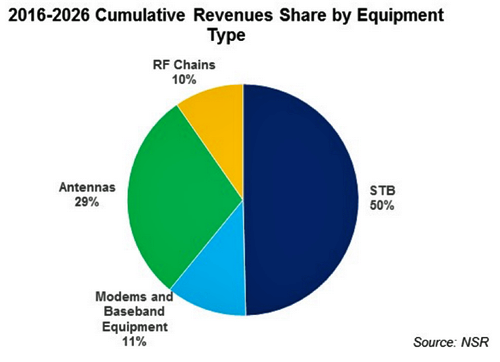 Consequently, STBs dominate 50% of the 10 year cumulative revenues by equipment type. However, growth will be challenging given saturation and pressure from alternatives in developed markets and a highly contested ecosystem in developing markets. The entire value chain is under pressure, from TV platforms to chipset manufacturers, antenna vendors, RF equipment and even STB integrators with consolidation (Arris-Pace, Technicolor-CISCO), verticalization (DishTV acquiring DBS and OTT assets from EchoStar) and exits (STMicroelectronics shutting down its STBs chip business) taking place. Still, STBs can continue to capture growth if the industry is able to leverage trends like multiscreen and UHD. Multiple operators are considering major technological upgrades to take advantage of the new compression and modulation schemes while catching up with the convenience of OTT. Antennas will also see most cumulative revenues coming from the satTV segment, but growth in this vertical will be sluggish. On the other hand, the explosion in consumer broadband subscribers will stimulate revenue growth. High-end markets like Aeronautical SATCOM, using highly sophisticated antennas, or cellular backhaul, progressively using premium non-GEO terminals, will also become fast-growing opportunities. While the lower-end use cases will suffer continuous commoditization, the antenna market also sees opportunities for differentiation and technological evolution. Non-GEO terminals will gain traction with the arrival of LEOs and expansion of O3b into newer applications. Furthermore, electronically steered FPAs have the potential to disrupt the market, especially in mobility segments. Despite driving a smaller portion of the 2016-2026 cumulative revenues, modems and baseband equipment will generate the highest net revenue growth of any equipment type. Consumer broadband will be the fastest revenue generator. However, this does not necessarily translate into profits as vendors many times need to leverage a service component or follow a “loss leader” strategy monetizing high-end terminals. VSAT platforms need to quickly adapt to the new requirements incurring heavy R&D investments. Scaling to Very-High Throughput Satellites, providing application flexibility, boosting payload utilization, improving efficiencies or optimizing traffic at higher layers of communications are key technical aspects that vendors need to incorporate in an increasingly competitive environment where fewer-larger deals could become the norm in the future. 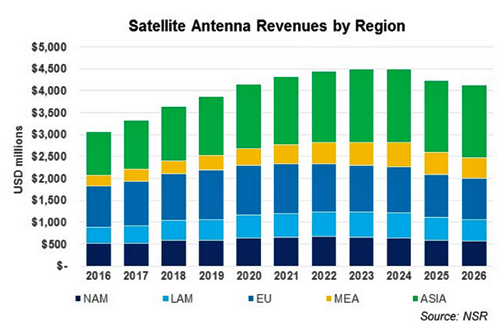 While the largest single contributor to RF Equipment revenues, broadcast Earth stations, will see continuous revenue declines, other markets will see booming levels of demand. Mobility applications together with higher-end Enterprise VSAT and Cellular Backhaul present the best opportunities in parallel with Broadband Earth Stations. The lower-end section of the market might be commoditizing but at the same time, power requirements are growing with larger data throughputs and premium applications growing at a rapid pace. The ground segment must be a key protagonist in the current transformation of the satellite Industry. From unlocking the low-income markets with cheap terminals to allowing the most sophisticated applications for airlines or mobile operators, the ground segment must catch up with the progress in space segment. SatTV will continue to generate the highest volumes of demand for the foreseeable future, but the different broadband applications will drive growth. This will translate into stagnant revenues for STBs while antennas, RF equipment and VSAT platforms will experience growth. Report authored by Lluc Palerm-Serra, Senior Analyst, NSR, Spain.